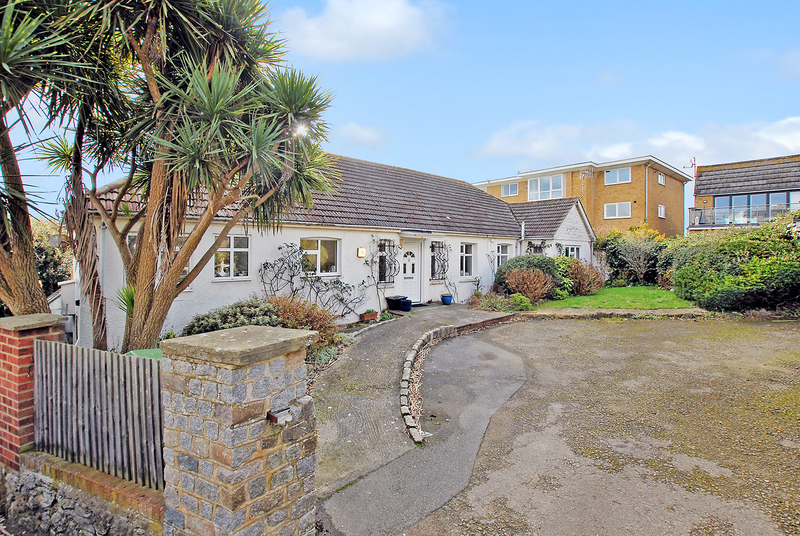 Sunnyside Road is a desirable cul-de-sac accessed from The Esplanade (A259) that runs along the coast between Sandgate and Hythe, moments from the beach. It is only a short walk along the promenade with the wide stretch of shingle beach alongside to the charming and sought-after village centre, with its eclectic mix of local shops, antique shops, boutiques, public houses, cafes and restaurants. The High Speed Rail Link service to London, with a journey time to St Pancras of less than an hour, is available at Folkestone West Station (1.7 miles) and Ashford International (16 miles) and Eurostar services to Paris and Brussels are also available at the latter. The M20 motorway network and the Channel Tunnel Terminal at Cheriton (Calais 35 minutes) are both about 3 miles distant. (All distances are approximate). Heatherbank enjoys an appealing situation in a peaceful enclave set just back from the seafront, the property occupies a generous plot in an elevated position from where it commands superb southerly vista with stunning views of the sea. The property provides around 1401 sq ft of versatile accommodation which has been thoughtfully designed to ensure that the views to sea are maximised from each of the principal rooms. The accommodation includes a welcoming entrance hall leading to a particularly generous dual aspect sitting room with doors to the garden and archways to the kitchen and separate dining room. The kitchen/breakfast room leads to a large utility room. There are three double bedrooms, one incorporating a shower, a study area together with a bathroom and wet room. The garden is delightful with a large terrace facing south and enjoying views of the sea and the remainder of the garden laid mainly to lawn and sloping gently away from the bungalow. To the front is a generous driveway leading to the detached double garage.